To use the hub, simply navigate to the UCSC Genome Browser Track Data Hubs page, scroll down to Rfam 12.0 and click on connect. 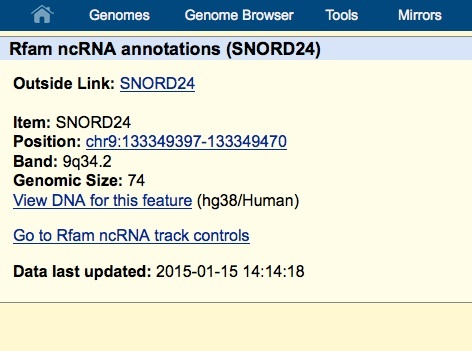 You can then select any of the assemblies listed above to view Rfam annotation in the UCSC Genome Browser. Click on the image below to view an example. Clicking on a match gives you the positions of the match, a link to the Rfam family page and the option to retrieve the genome sequence of that match. This entry was posted on	May 14, 2015 at 1:43 pm	and is filed under Rfam.